The all-new 2015 GLA-Class from Mercedes-Benz will make its global premiere in Frankfurt in September and is available online now. How will it compete with the BMW X1, Audi Q3 and the Range Rover Evoque? 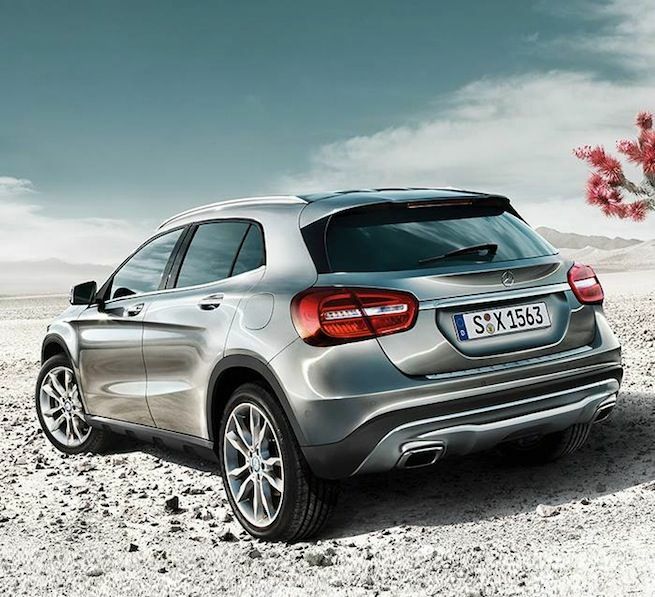 The all-new 2015 Mercedes-Benz GLA is impressive and the new luxury SUV reinterprets the compact luxury SUV segment. Mercedes calls it a compact SUV, but it’s larger than it looks. Mercedes designed the new GLA to compete with the BMW X1, Audi Q3 and the Range Rover Evoque, and it’s roughly the same size as these three rivals. How will the new GLA compete in the fast-growing compact SUV segment? With a length of 173.9", width 71" and height of 58.8,” Mercedes has clearly positioned the GLA in the premium “compact” SUV segment. With fuel consumption as high as 37 mpg and its luxury equipment, the new GLA Class will surely be a strong competitor with young active buyers who have never purchased a Mercedes vehicle before. As Mercedes positions itself to be the world’s number one luxury automaker, the GLA will play a key role around the globe. The new GLA Class is a “utility player” with hallmark Mercedes-Benz SUV genes, but with a much more youthful appearance and agility. Mercedes designed the GLA to appeal to a new generation of buyers and they succeeded in a big way. The low greenhouse, raised body and large wheel arches give the GLA great visual appeal. The modern appearance, smaller size and utility will be three reasons young urban buyers will be attracted to the new GLA-Class. They will use the GLA as an urban commuter on cold days when they aren’t riding their bicycle to work. And on weekends, the sporty SUV will be used for excursions to the beach and mountains for surfing, skiing, hiking and biking. Mercedes has hit on just the right combination for this new generation. The optional 4MATIC all-wheel drive, the robust body structure and the variable interior concept guarantee plenty of recreational enjoyment. Most buyers don’t need an SUV that can climb a rock face like a Range Rover. Most will never use it in extreme off-road situations. They will use the GLA for daily urban commutes during the week and for going to the beach and mountains on the weekends. If they do get off-road, models with 4MATIC are equipped with DSR (Downhill Speed Regulation) and an off-road transmission mode as standard. DSR is activated by a control button in the center console, and assists the driver on demanding downhill stretches by maintaining a slow, manually selected vehicle speed within the physical limits when negotiating downhill gradients. GLA will come with all the new high-tech features younger buyers are looking for. It will come with the brand’s acclaimed connectivity service mbrace2, providing users with an extensive range of online and concierge services and apps all linking seamlessly to smartphones for use inside and outside the vehicle It uses the latest cloud technology and offers users wide-ranging and flexible access to content. Look for the all-new 2015 Mercedes-Benz GLA-Class to be a big hit with a new generation of consumers. Look for GLA with front-wheel-drive to arrive in U.S. showrooms fall of 2014. The all-wheel-drive GLA will be available in the U.S. in early 2015. The new 2015 Mercedes-Benz GLA-Class is available online now at www.gla-class.mercedes-benz.com. Stay tuned to Torque News for Mercedes GLA pricing when it becomes available.